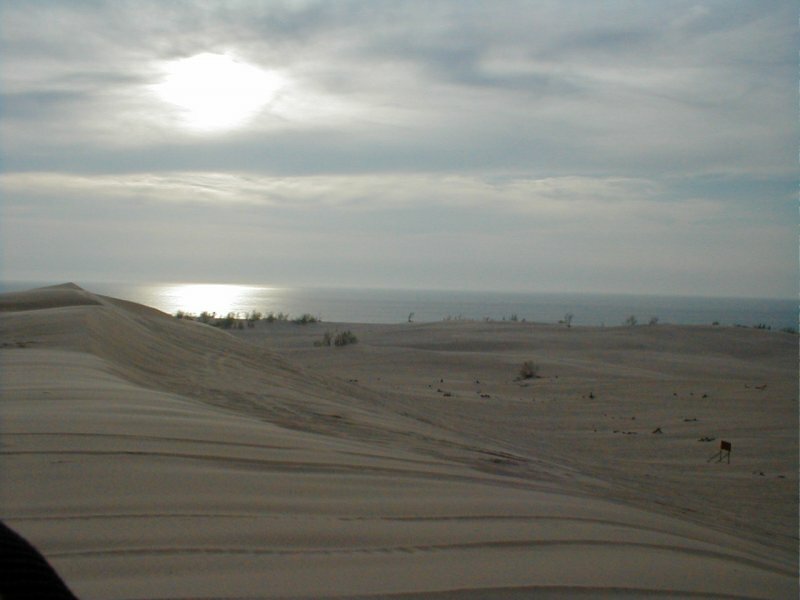 This weekend I got to take a trip up to the sand dunes at Silver Lake, MI. What a blast. I met up on Sunday with a bunch of Pilot guys. They had a gathering going on and I decided to crash the party even without the Moskito. I took the YZF instead. 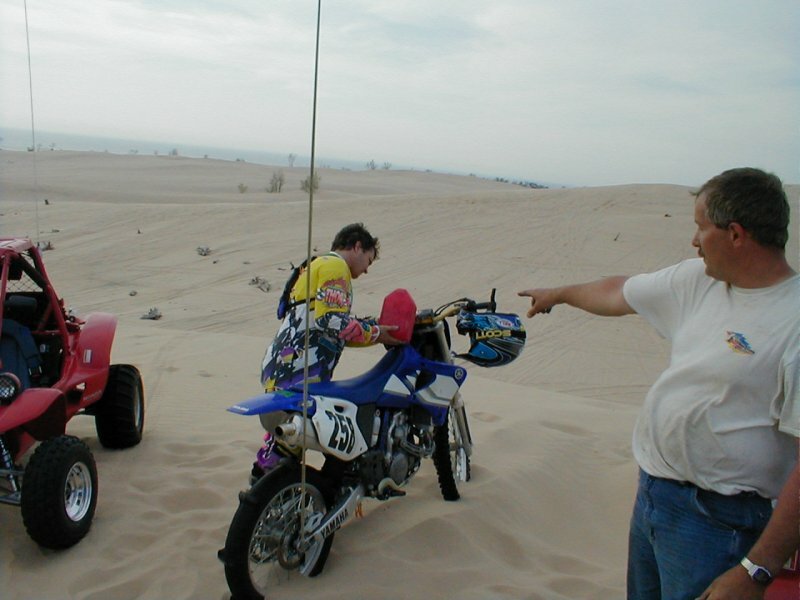 I got up to the dunes about 3:00 p.m. and started meeting the guys that I knew by names like Hoser, Kiowa, Hot400R, Gottaride, MGR, Rocketman, RedRider and Eric (who I apologize to because I can't recall your screen name - and thank for letting me share a hotel room - MUCH better than sleeping in a van!). I also saw Haus there - with a torn up car. He'd been chasing problems all weekend and a blown inner CV was more than he could fix. A great group of people to ride with! After working on getting names and faces straight, I fired up the YZF and headed out to the dunes. Still running the regular motocross rear tire was just not the hot ticket. 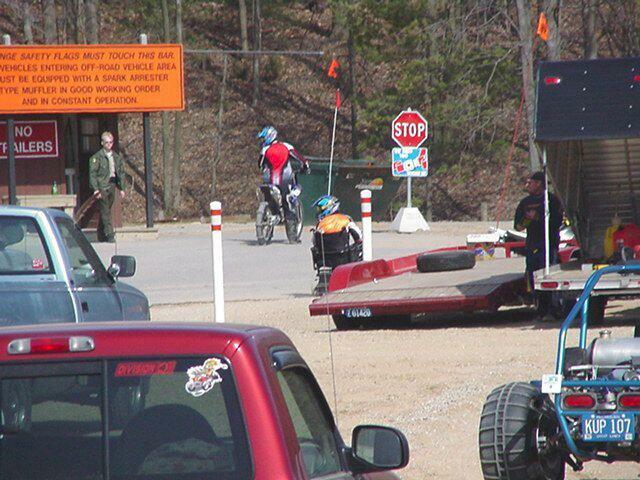 The bike spun the rear tire and squirmed around. Ten minutes of that and I was headed back to the pits and put the paddle tire on. 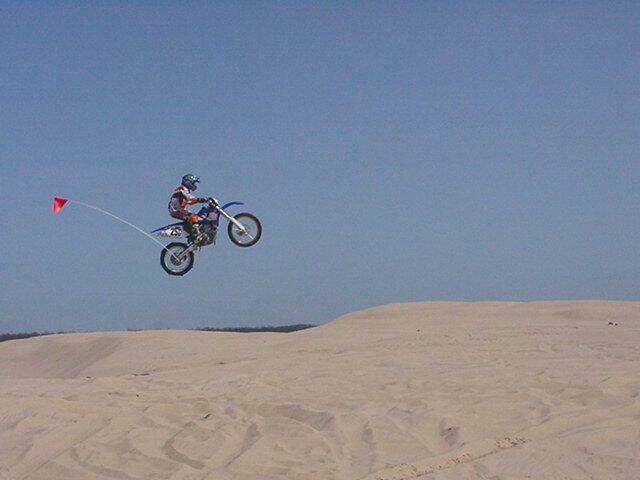 Ah, back to what I'd been so used to at Glamis. Sunday started out as a different story. The weather was overcast and the wind was wicked. The sand was blowing so hard that it actually stung my nose enough that it made my eyes water. I came back and decided to wait a while and see what it would be like a bit later. We went back out and found a couple ridges that were a bit sheltered by another dune and they were perfect for jumping off of. 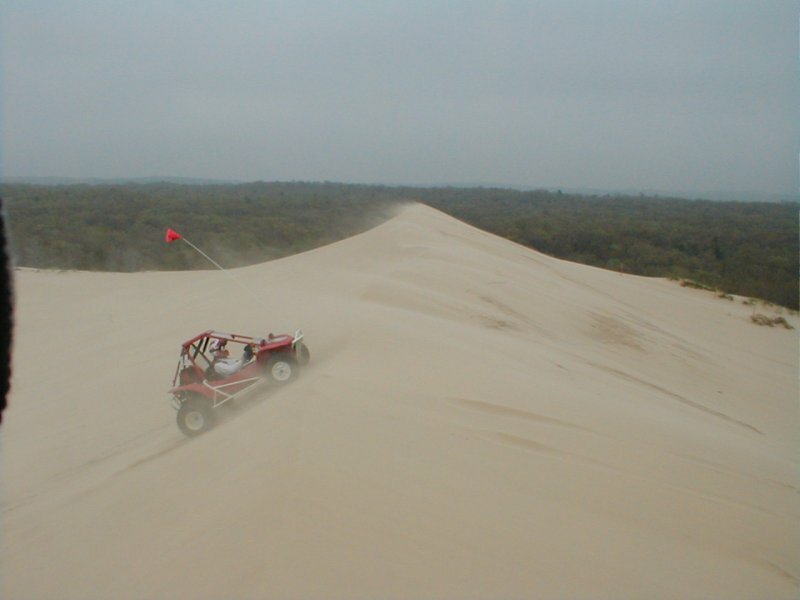 Get a run at the face of the dune and launch off the top onto a nice little flat area. Turn around and do it again. The Pilot guys and I played for about an hour there. The rain came in about half way through the day and it made me happy! Traction in the sand goes up and you don't dig in when it's wet. The rain started coming down and while all the Pilot guys headed back to the pits, I turned around and went to play in the dunes! It didn't take long for me to high tail it back to the pits as soon as I saw one really good lightning flash. 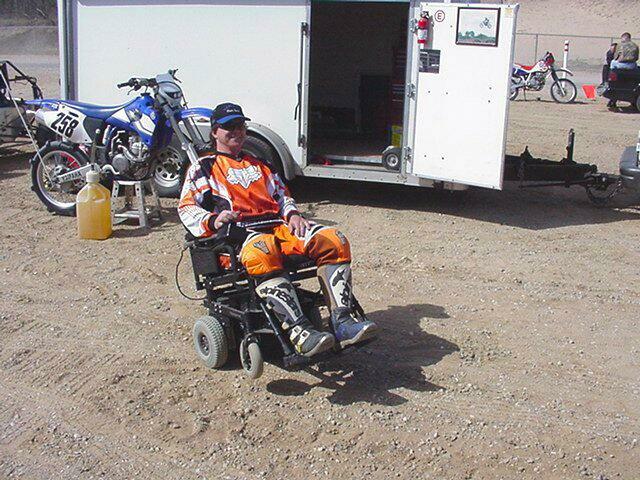 Neil from ATV was hit by a bolt last summer and I didn't think following his lead was a good idea. The skies opened up and then cleared out a bit. The wind had dropped down and the lightning quit. I went on a check run and came back to tell the Pilot guys "Let's Ride!". 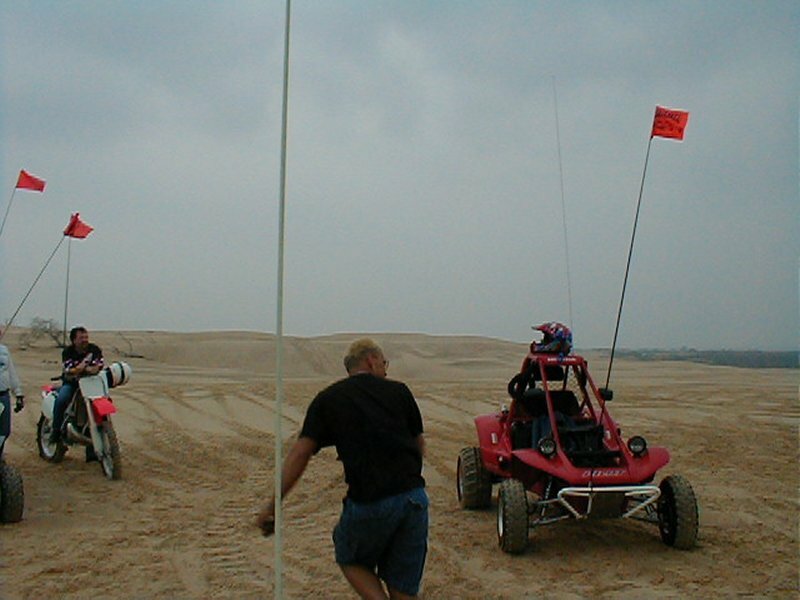 The dunes were PERFECT. 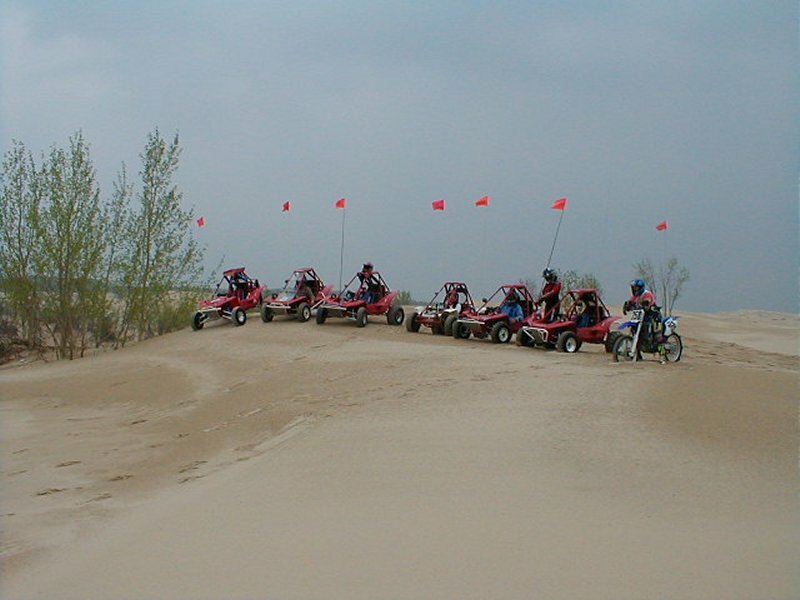 We went blasting around the dunes for a while, playing follow the leader and try to avoid getting behind anyone with a paddle tire (Bill & me). We finally went back to the jump area and discovered that it was absolutely killer for playing on again. I had two scary incidents, one was the dreaded nose down landing. 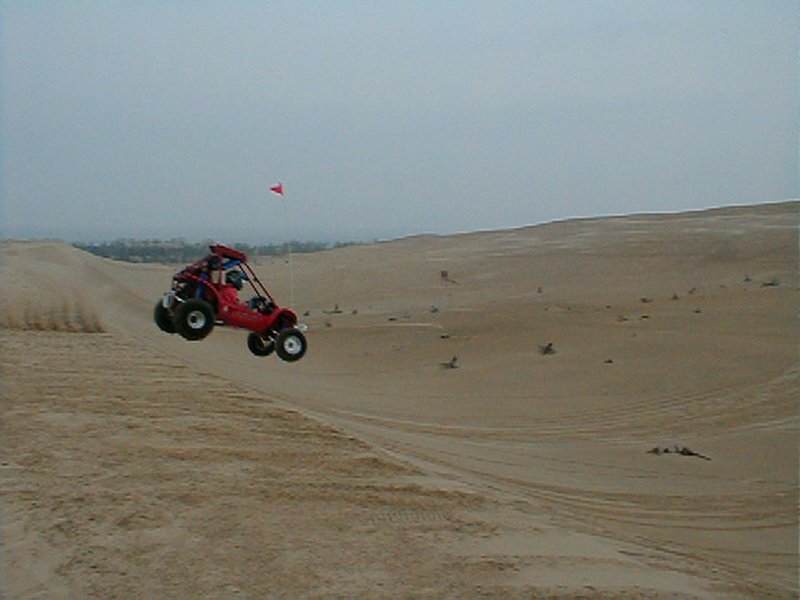 I hit the edge of the dune where it was quite round and the front end just didn't come off the ground like I expected. I hate that feeling! The second scare was the bad one. The face of the dune was probably about 60 to 70 feet high with a nice edge at the top. I was blasting up the face in fourth gear about 1/2 throttle. I'd get a bit farther each time I'd jump it. Well, it just so happens that there's this Jeep sitting at the top of the dune - it had been there for twenty minutes or so. I come flying up the face of the dune and "OH &%(#!" The guy's started moving and he's pulling right into my landing path! I locked up the brakes in the air and stuck the bike in the sand pretty hard. I kinda bounced and then landed in a kneeling position. No damage done, no pain. That was CLOSE! Can you say ADRENALINE RUSH??? The Pilot guys had been trying to get me in a car all weekend. I usually don't like to switch from the bike to a car or vise versa - the timing thing with the throttle and such is so different. But after this close call and the adrenaline still pumping thru me, I decided to take up Bill on his offer (challenge to see if I could "put my money where my mouth is"?) of hopping in his Long Travel Pilot. The first thing I noticed was what a difference it is getting in a car with stock motor and just a pipe. Where I'm used to this monster hit and torque from the engine, his car was quite tame. I really wanted it to go faster. I started out by hitting the jump pretty easy. I didn't know what to expect. The Pilot guys held up their jumping scores (how many fingers do you see?) and I was seeing ones and twos. I turned around and headed off the edge we were jumping up. This was a small "downward double". It rolled off about fifteen feet, came out a bit and then rolled on out again and on down. On the YZF I was going off this ledge in second gear and landing about half way down. I kept saying I could do that in a Pilot. No one believed me until I went blasting over the edge in Bill's car. Everyone said Bill let out a yelp and went running the other way covering his eyes. Heck, I didn't even hit it that hard! The car wouldn't accelerate hard enough to get any descent air off the cliff! 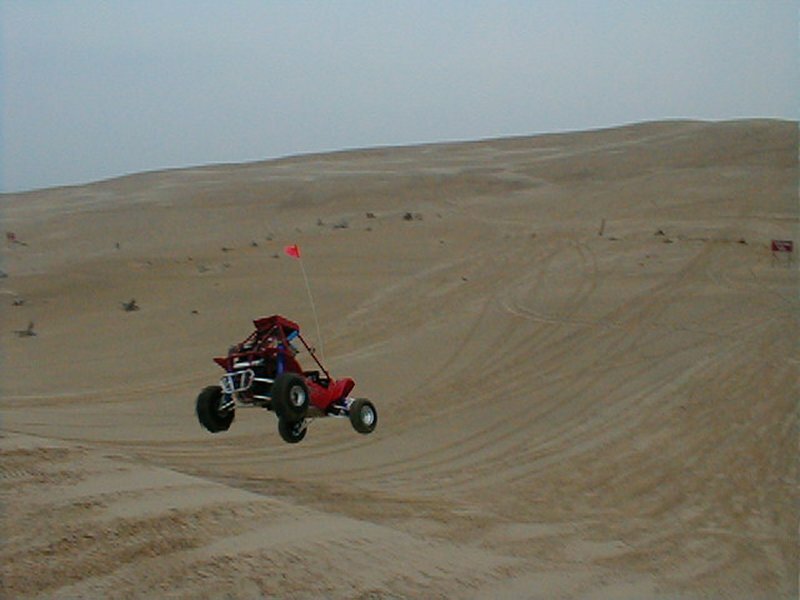 I got in a couple descent launches back up the dunes and pulled off one that got about five feet of air. Bill's car works very well, it just needs some HP. Can't wait to stick him in the Moskito and show him what the 500's like! Even Eric (who was by far the most aggressive of the guys there) wouldn't go off the edge and informed me that I was now the "Crazy One of the group". I kept telling them that it was ok to go off the lip - heck I even offered to show them with Eric's car - but no one would let me! Bill just kept looking at me, looking at his car, looking back at me and shaking his head. "Come on Bill! You can do that - it's really easy!" He just shook his head and said no way. I really wish I had the Moskito there. It would have been absolutely killer! As soon as I get my axles, some time on the Moskito and can get a set of paddle tires done up, I'm heading back to Silver Lake! What can I say? I had a backup plan in place just in case the Moskito died. What was this backup plan? The YZF of course! It was still in it's sand gear - paddle tire, lighting coil/flywheel weight and lights, sitting in the back of the van, ready to hit the dunes. This is my fourth trip to Silver lake, third with the bike, so I'm pretty familiar with the area. 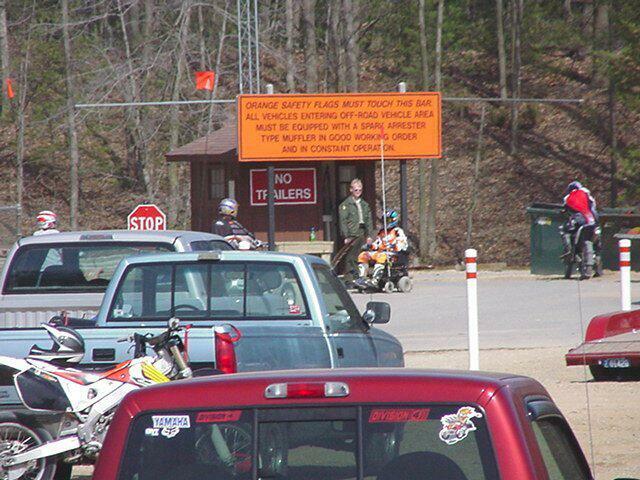 I headed off down the entrance road, made a right at the end and whacked the throttle open. Off through the whoops and then out to make a couple laps over the dune ridges so I could get a feeling for the sand. Fortunately I still had my "sand legs" under me. The last time I had been on the bike was out at the Imperial Sand Dunes about a month earlier and everything felt just right. It wasn't long before I was looking for places to launch my ride. I remembered that the last time I was there that the western end of the second ridge had a really good flat face that was perfect for jumping. The landing area was flat or slightly down hill. This weekend, because of the winter winds, the dunes had perfect form. I hit an area that looked pretty good and nailed a perfect medium jump right off the bat. I then went on to the next ridges searching for good launches. After about four or five laps, I had a pretty descent path figured out and then started just running laps trying to get faster and fly farther each round. Wasn't long before the Pilot guys caught up with me and I abandoned the lapping and went playing for a while. We finally headed into the pits and I had a surprise in waiting for the guys. I pulled out the bullet cam and attached it to my helmet. Hoser was impressed and was looking forward to what it would do. I got the camera set up and headed out to the dunes. 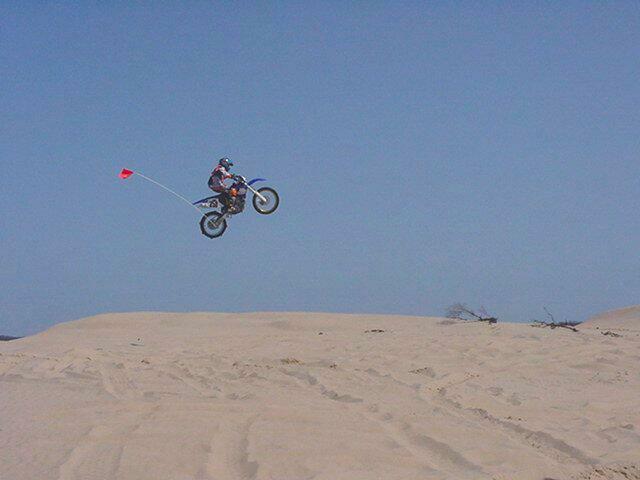 Now, I'm not tooting my own horn here, but the jumps I was pulling off from the second dune ridge were AWESOME!!! I've never ever jumped anything like this before. (I have witnesses, there were pictures and video were taken!) 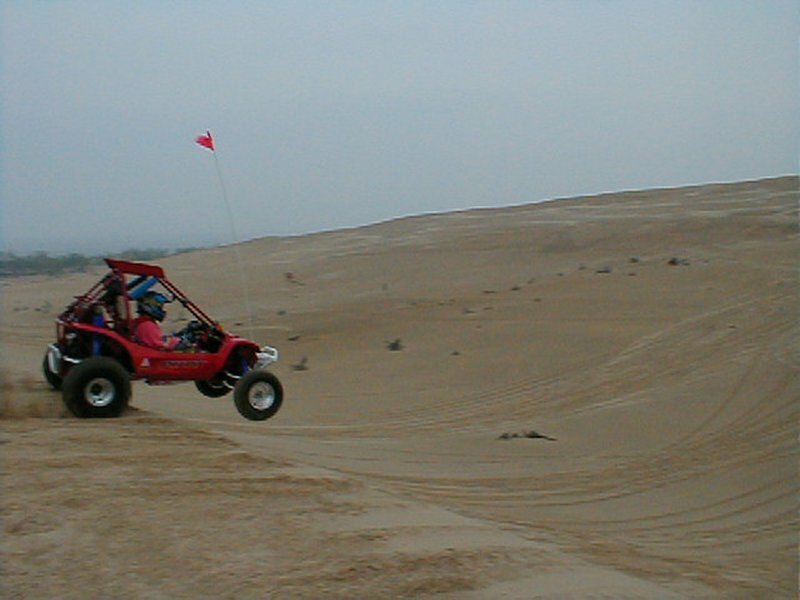 I was launching off the top of the dune in the top of third gear, getting an easy ten feet of air and flying forty to fifty feet. Before long, I was shifting to fourth gear and getting more air and distance. 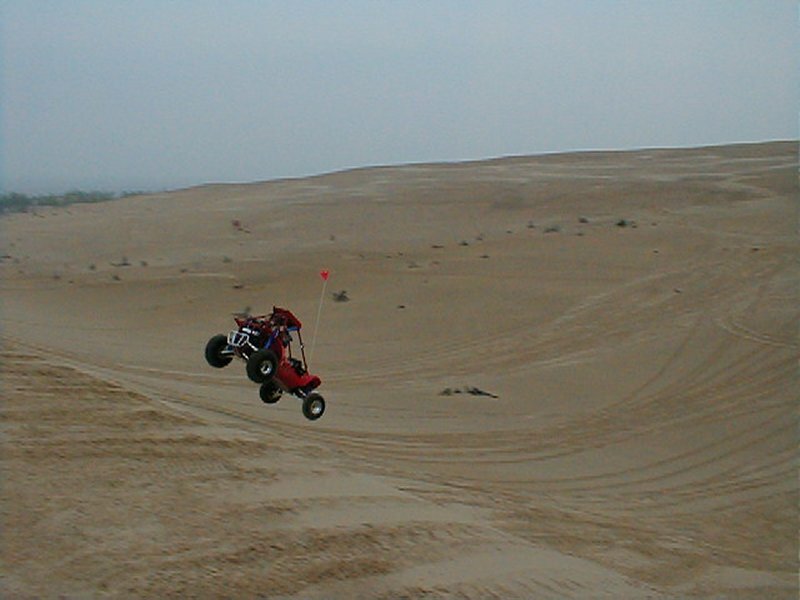 I was also getting a lot more aggressive through the dunes between ridges too. I finally wore out and headed back to the pits with the camera. What a shame. Sometime during the first part of my ride, the camera ended up getting pointed down. All you could see was the front fender and wheel of the YZF. Every now and then you'd see the wheel leave the ground, but in general, it was a crappy filming. Darn. Gotta try again! The Ride: Rolin Frctn's chair! First, I found a flag. 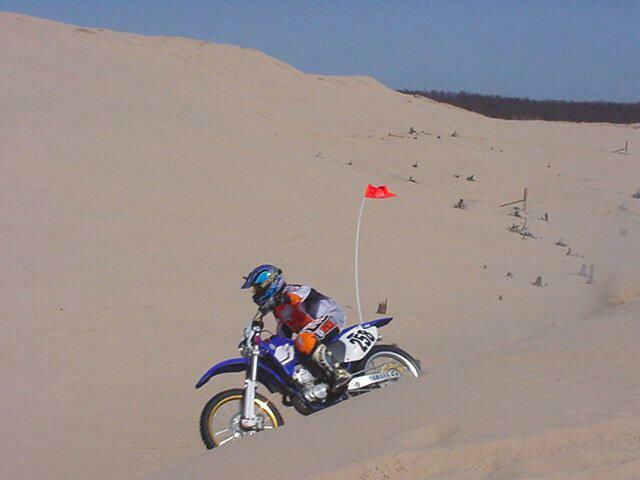 After all, the DNR guys won't let you out in the dunes w/o a flag! Next, Helmet, Goggles, Gloves & Kidney Belt. Hey, I was going out to play. Always wear proper safety equipment! It was about a 100 yard drive to the entrance to the dunes. The looks I got were hysterical. 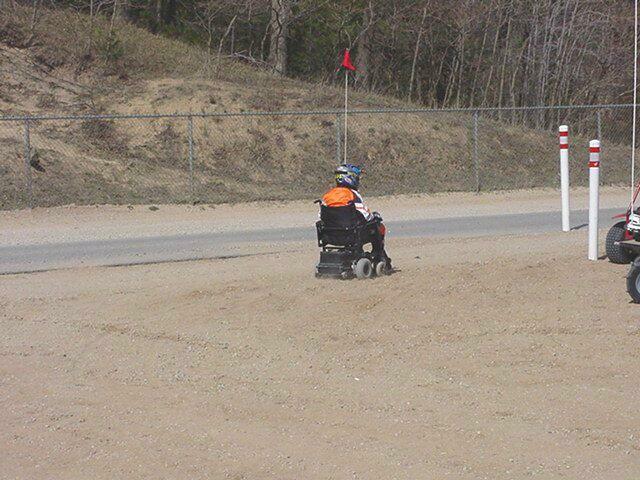 Here I was, fully dressed in my motocross gear sitting in an electric wheelchair heading towards the dunes. I pulled up to the guard shack (trying to keep a straight face) and then attempted to proceed on through the entrance. The guard did a bit of a double take and then, with a very straight face, said "I don't think so." "But why?" I asked. "Do I need to have paddle tires?" the guard cracked a smile and then started laughing. 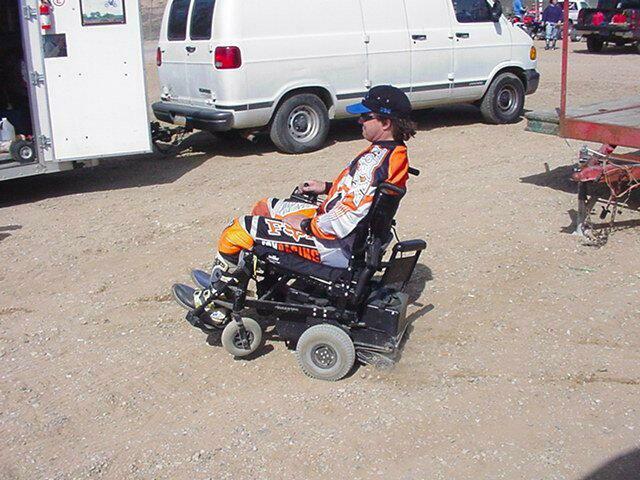 I headed back to the pits, denied of my ride. Oh well! We roosted through the dunes for the rest of the day. I'd catch the Pilot guys every now and then, follow for a while and then head back to do my "laps". I was airing out over the second ridge jump in the middle of fourth gear now and I was attacking the final dune ridge the same way. My goal on the last ridge was to clear the entire top and land on the down side. I was landing short by about ten to fifteen feet. At the end of the day I was absolutely beat and feeling weary. I headed back to the hotel and went to sleep early. Sunday morning was PAINFUL! I woke up and felt like I'd been beaten with a big stick. From all my jumping I was SORE!!! I've never had my elbows hurt before! I found muscles that I've forgotten about. I had breakfast and then headed on over to the parking area, fully planning on letting everyone know that I was done for the weekend and headed home. Funny how plans change! Then I heard the news from Hoser: "Hey Moskito, did you know that Alain's gonna be here in a few minutes?" All I could think was "Great. Here comes Alain, we didn't get along well the last time we were together, and to top things off, the Moskito's dead." Wasn't too long and here he came. I want to be the first to say that I was impressed. He immediately came up to me and said hello! I was told later that he had made the comment that what happened in the past was long ago and that he was going to let by gones be by gones. I agree whole heartedly and I'm glad he took that approach. Alain had two Draks with him. An older model that had some history behind it - something about the last owner having an engine problem and then managing to roll it and then the new Drakart "version II". He's been working VERY hard to make a quality product and judging by what I've seen on the original and now on the new car, I'd say he's well on his way. I was quite impressed. We talked about what he'd done and then he finally asked if I had the Moskito with me. I was pretty hesitant to show it to him. After all, it's in its third set of suspension components and, to be quite honest, looks like hell. I opened the back of the trailer and he smiled from ear to ear. "Ah, I can relate!" he said. He went on to say that he fully understood the present "condition" of the Moskito, as the original Drakart had gone through the same constant evolution that the Moskito is going through. He looked it over and actually seemed to be somewhat impressed. By this time I was ready to get back on the bike. I wanted to get more photos of me jumping and also some more video from the helmet cam. We all headed out to the dunes and started playing for the day. One really funny thing to watch on Sunday was DunePilot. His Pilot had eaten its engine the day before and he had planned on heading on home early. 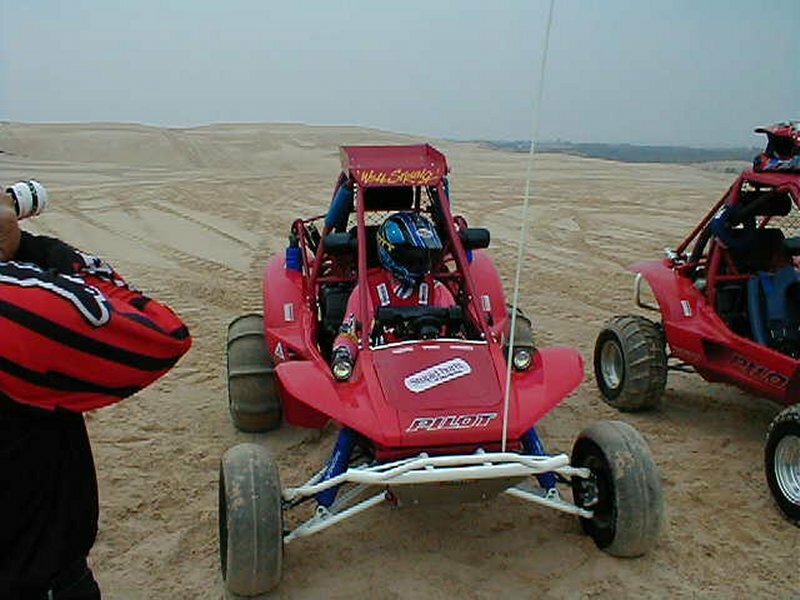 Well, being that Alain had two Draks with him, DunePilot got to play in one for a while - all he could do was smile from ear to ear and make these funny noises - "This thing is OHHHH! ", "It's just so AHHH!!! ", "I can't believe how fast this thing is!" It was pretty cool to see someone having as much fun as I was! I followed the guys down by the beach and kept waiting to hear it, then there it was - "brruuuwwwwaaaaaaa" - DunePilot finally got to a section where he could uncork the Drak. I have to admit, there's something about the sound of a twin that's awfully killer! I finally headed back to the pits - to put on the helmet cam and then the guys followed in. Well, everyone except Alain. Seems that when one of his mechanics back at his shop assembled one of the axles, he didn't get a clip in quite right. The result was a broken CV. They headed back out with a pickup truck and pulled him back to the pits. DunePilot's day was done, as Alain had to "borrow" one of the axles off the car he'd been driving. 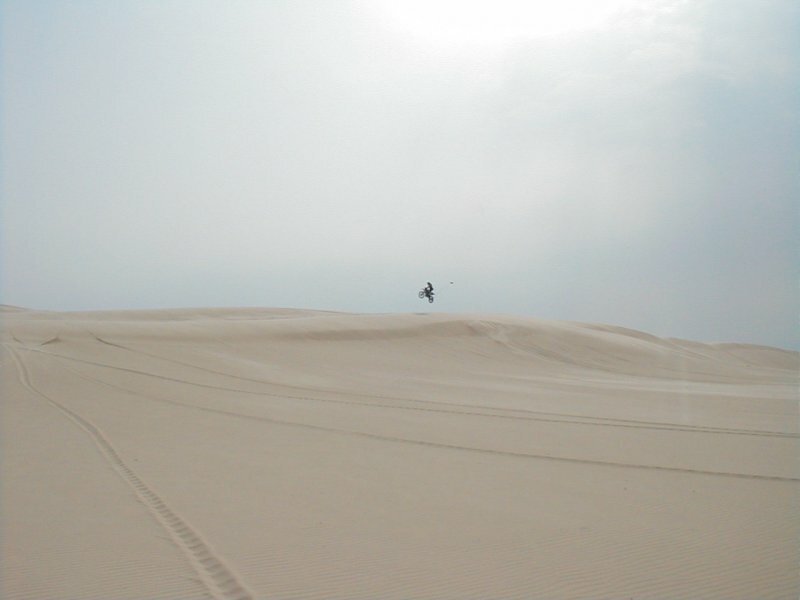 Still, DunePilot was happy as a clam that he'd been able to play in the Drak for the majority of the morning. During this time, I worked on getting the helmet cam set up. 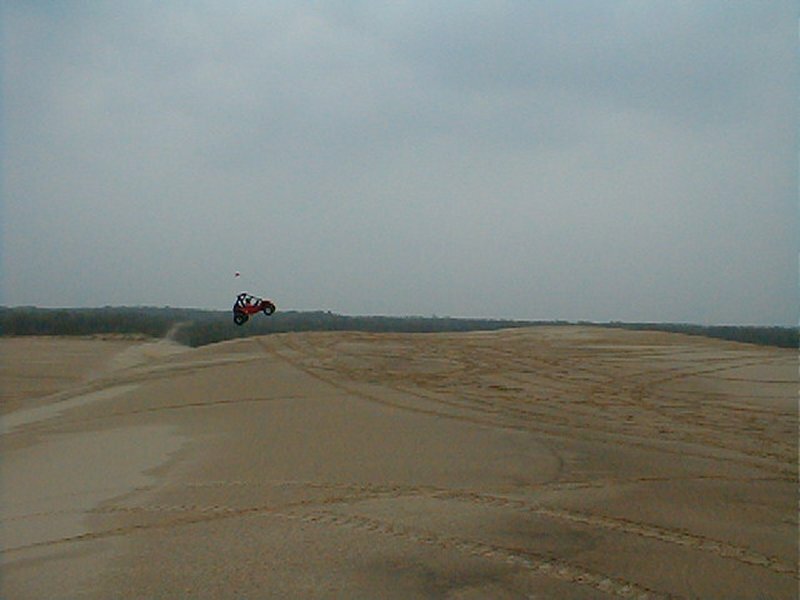 Once ready, I headed back out to the sand, helmet cam recording, and headed straight for my big jump. I hit it wide open in 4th and ended up jumping about ten to fifteen feet farther than I had done on any attempt before. It was a perfect launch and landing. From there I started my run over the dune ridges and on that final ridge, I hit it and managed to clear the entire flat top section. I was STOKED! I did about five more laps and then pulled over to watch the guys do some jumping with a bunch of other quads and bikes. I threw in a few jumps too and then headed on back to the pits to check the video. Don't ya know it. I worked very hard to make sure that the camera was pointed correctly. First time all I had was ground, this time, well, let's just say that the horizon was visible some times. I had the camera pointed just a touch high! Anyhow, it was a lot better than the video before! I finished off the day by raging through the dunes for a couple more hours. I would go back and try to out jump the last marks that I would leave on landing and see how fast I could run between the ridges. All in all, it was an even better day than Saturday - and it was just about perfect!